Cosmos offer a burst of vibrant and pastel colour with distinctive feathery foliage and benefit from a long flowering period. They are one of the easiest flowers to grow due to their low maintenance. Unwins have a variety of Cosmos in their range, bringing a large choice of colour to your garden. For example for beautiful pink blooms, ‘Double Click Rose Bon Bon’ is ideal, or for a vibrant orange, ‘Phoenix’ is the one. Cosmos seeds should be sown between March and April for the best results. Cosmos seeds should be sown into a small tray, filled with compost, about 3mm deep and watered in, cover with a sheet of glass or polythene and keep the seeds in a warm place (about 15 to 25 °C) such as a greenhouse or warm windowsill. This will help the germination of the seeds which should take about a week. 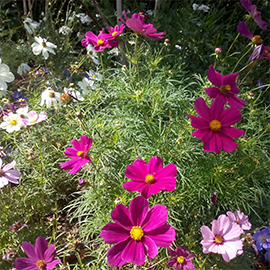 Cosmos plants can be planted out in the garden when all the danger of frost has passed. This is usually around May. It is best to plant them in a sunny spot and into soil which has has some organic material, such as Farmyard Manure, dug into it. This will help them to retain water. They should be planted 30 to 45 cm (12-15 inches) away from each other to allow for bushy growth. If your garden is in a windy location it is a good idea to stake and tie the plants. However, normally the plants should be sturdy enough to require support. As you plant the Cosmos plants into the garden it is advisable to pinch out the growing tip of each stem. Pinching out involves squeezing the growing tip off between your finger and thumb. This reduces the plant size and will encourage the plant to grow side shoots giving bushy growth. This technique produces more Cosmos flowers. Deadheading regularly will help Cosmos to bloom longer. A good tip for deadheading Cosmos is not to just take the flower head off, but cut the stem right back to the first leaf below the flower head. Once you have cut the Cosmos flowers, put them straight into water. If you pick them just as the buds are about to bloom, they will last 7 to 10 days. Growing Cosmos is really this easy. Give them plenty of light and water and they provide you with a beautiful flower to decorate your home.